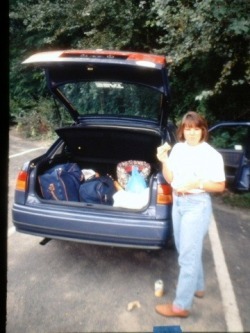 Got up and out of our twin beds about 7 – 7:30, packed up and headed out at 8:30, sans breakfast. 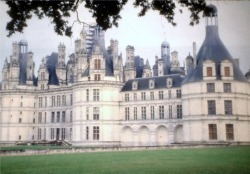 Headed south 5 minutes to Chaumont Chateau, which I had seen last night fully illuminated on the way home from dinner. It wasn’t open until 9:45 and we realized also that it was not one of the 3 chateaux recommended by Rick Steves. So instead, we headed north, past the hotel, to Blois. Went to the Boulanger / patissier and got a baguette, 2 small tomato quiches, and 2 sugar profiteroles. Then went next door and got grapes and 2 chesses. Found a post office, bought stamps and mailed postcards, then found a supermarché and bought some paper towels, bottled water, and cookies. All set! Chateau time! 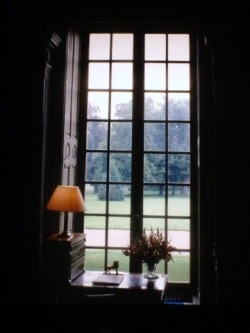 The first one we hit was Chambord – very large, many turrets, not crowded – and once we were inside it began to pour rain and became very dark inside. With the thunder pealing through the clouds, it seemed as if we were in Transylvania. 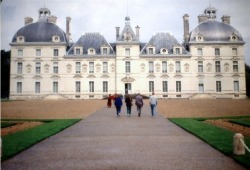 There was a double spiral staircase designed by Leonardo da Vinci that was the focal point of the Chateau. It was still pouring when we wanted to leave, but we waited a few minutes and it cleared enough so we could get back ½ mile to the car without a soaking. Then it was off to Chateau Chéverny. The highlight was the beautiful furnishings – contrasting with Chambord which had few original furnishings. Chéverny’s first 2 floors were filled with priceless antiques. The 7th generation of the original family still owns Chéverny and lives on the 3rd floor. Before touring the chateau, we stopped at the kennel and saw (and smelled) their pack of hounds. They look like Basset hounds, with long legs. Sound like them too. The interior was spotless, with great furniture, like an 18th c. oak dining room, French bowed chests of drawers, 17th c. working grandfather clock, etc. Signed document from George Washington. While we were inside it started to pour rain, but it stopped by the time we left. Gardens were very nice, filled with impatiens. The main court of the chateau spans the river and served as an access point between Nazi and free France in WWII, to exchange prisoners over the river. 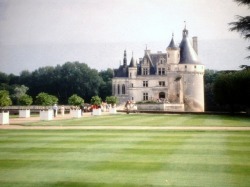 Thought about spending the night in the town of Chenonceau, but left for Amboise per Rick Steves. Amboise was too crowded though. We also attempted a couple of country lodgings (1 closed, 1 too small) and the town of Montlouis before heading back to Chenonceau. Got a small room with a squeaky bed for 280F ($54) at the Bon Labourer Hotel. For dinner we each had vegetable potage (soup), which was a tasty broth, no vegetables. Had salad too, and duck leg for dinner – pretty good. Cheese course and a very good nougat ice cream with raspberry sauce, followed by Grand Marnier topped it off. The room, which was noisy in the afternoon, was by this time quiet, and we dropped off to sleep.